While this New Year sees the bicentennial of American Catholicism's first expansion, the River City landmark that laid much of its groundwork will spend its 2008 marking an even more venerable, and hard-won, milestone. 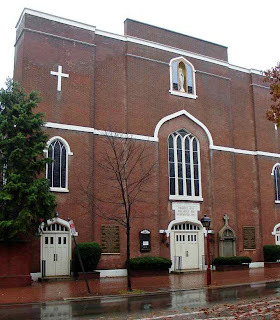 A morning liturgy yesterday opened the 275th anniversary of the nation's first urban parish -- Old St Joseph's. 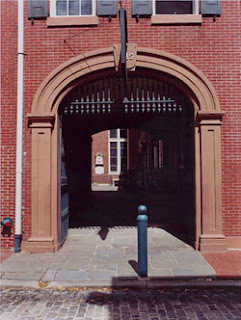 Founded in 1733 by Jesuit Fr Joseph Greaton and still in the Society's care, a plaque inside its courtyard notes its beginnings as "the only place in the entire English speaking world where public celebration of the Holy sacrifice of the Mass was permitted by law." Though the "holy experiment" of Pennsylvania, established a half-century earlier by William Penn and his Quaker brethren, had sought to foster religious tolerance, the lingering suspicion of "Romish" settlers inhibited that freedom, a climate that restricted their first gatherings to private homes. 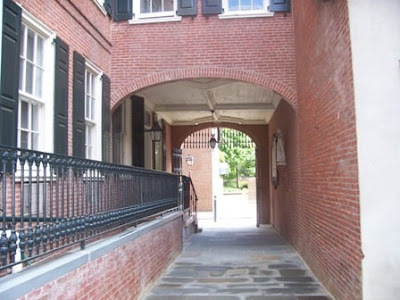 Accordingly, the founding venue for public worship was hidden away in "a place of quiet seclusion" on Willings Alley, a narrow passageway off 4th Street two blocks from the future site of the "State House," as Independence Hall was then known. Despite the discretion of Greaton and his flock, the sheer existence of a "Romish chapel" stoked enough paranoia that its first years saw a number of high-placed attempts to shutter it. The parishioners initially numbered around fifty, but grew sufficiently within three decades for a larger chapel to be built and a new Jesuit mission -- St Mary's -- to rise, this time in the open on 4th Street, barely 500 feet away. Still invisible from the street, the present St Joseph's was dedicated in 1838. It was eventually named a "National Shrine," one uniquely dedicated not to the patronage of a saint, but in tribute to the witness of the nameless few who braved much to build the church by living the dream of free worship. (On a side note, later to become the largest US parish of the Federal period and the diocese's first cathedral, St Mary's (left) provided the backdrop of the "Hogan Schism" -- the battle that pitted Philadelphia's first three bishops against elected boards of trustees for control of the parish's affairs. 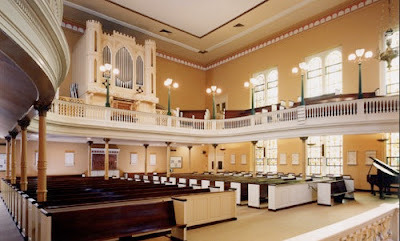 (The most prominent theatre of the national outbreak that became known as "trusteeism," the row's first salvos came in 1821, when the lay board banned Bishop Henry Conwell from entering his cathedral after the prelate excommunicated its trustee-backed pastor, William Hogan, who Conwell sought to oust from the body's chairmanship. Nine conflict-ridden years later, the appointment of the Irish-born, Propaganda-bred theologian Francis Patrick Kenrick as coadjutor to the aged Conwell and apostolic administrator of the diocese began the "Romanization" of the Stateside church and its first significant strides toward a centralized institutional apparatus with the ordinary as chief executive. (As Hogan's charisma and its effects birthed a culture tailored to ensure that their circumstances could never be repeated -- a dynamic that continues practically untouched into the present -- the insurrectionist cleric who went on to marry twice and manage a traveling circus remains the dominant figure in the life of the Philadelphia church. With no diocese existing on these shores until 1789 -- and formal jurisdiction of any kind coming just five years earlier, when the clergy of the 13 states elected John Carroll their mission superior -- the first century and more of the church's activity in the new land was almost entirely shepherded by religious communities. Among these, none approached the investment of the Jesuits, who first arrived in Maine in 1611 and, more prominently, in Maryland in 1634. Yet over the century of passage between Andrew White and Willings Alley, the adverse mood of the Anglican-friendly establishment forced the early missionaries to remain under the radar. While the period saw some attempts at establishing public missions far from the cities, the clandestine chapel off 4th Street marked the first time the faithful enjoyed the confidence to emerge in the context of an urban center. 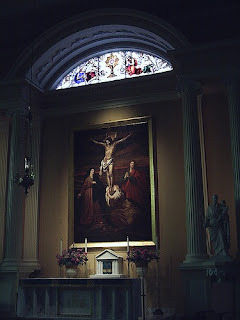 For decades, that status -- coupled with the Jesuits' near-monopoly of the mission-work -- rendered St Joseph's the central crossing of the colonial church. Though the Society was suppressed by the Holy See from 1773 to 1814, key figures of both the secular and professed clergy dot its ministerial record. The second archbishop of Baltimore, Leonard Neale, served a stint as pastor in the 1790s. A decade later, Willings Alley saw the arrival of the Fr Anthony Kohlmann, who then headed to New York, where a Dominican's death in Naples would make the German Jesuit the first resident head of the newborn diocese there. By 1830, it would also be the first urban charge of a young Fr John Hughes, the Irish-born street-fighter who went on to consolidate his people's presence to the north as New York's first archbishop and the builder of "new" St Patrick's Cathedral in Midtown. Along the way, its parishioners supported the foundation of a hospital, what would become the city's dominant Catholic university, and the high school that's produced generations of leaders both civil and ecclesiastic, including seven living bishops (a cardinal and papal nuncio among them) and, come Monday, its first-ever mayor of Philadelphia. The world outside its gates has changed drastically since 1733, but the Alley remains a cherished haven of grace. The parish counts 1,200 families on the books, but its reputation for warmth, top-notch worship and preaching have kept St Joe's a draw beyond its boundaries and one of the city's most energetic, diverse and youthful communities. The anniversary will be marked with a host of events throughout the year, beginning with a symposium on the city's early Catholic history this coming Sunday.